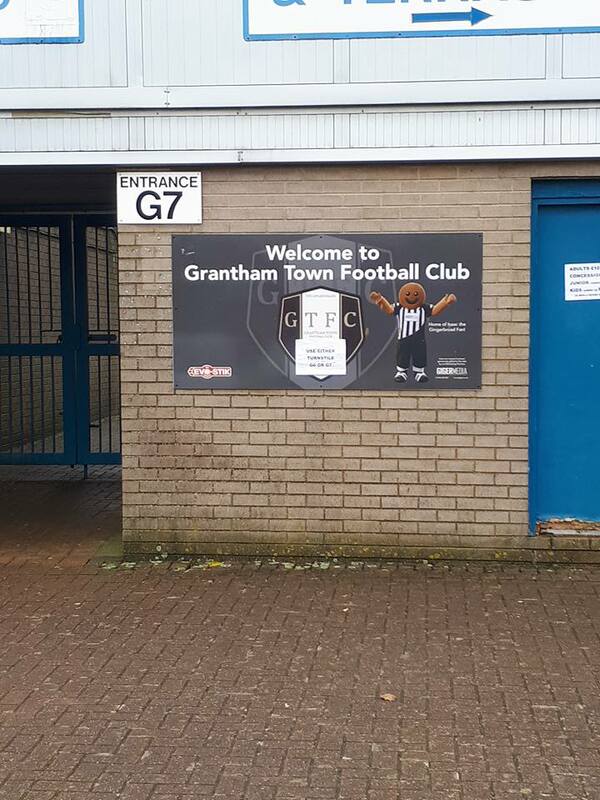 Grantham Town were founded in 1874 as Grantham FC, initially joining the Midland Amateur Alliance League, which they resigned from during the 1892/93 season. They then joined the Grantham & District League and stayed there for a few years before returning to their previous level, before then becoming one of the founding members of the Central Alliance League in 1911. At the end of the 1924/25 season, the club won the league and moved up into the Midland League, before joining the Central Combination League in 1933. However, they only lasted one season in this league, finishing second-from-bottom and then returning to the Midland League as a result. The club once again left the Midland League to join the Central Alliance League in 1959, being placed in its Division 1 South. However, like before, they didn't last long at this level and returned to the Midland League after two seasons. The club went on to win the Midland League in 1964, 1971 and 1972, as well as finishing as runners-up in 1938, 1965 and 1970. After the title win in 1972, the club were promoted to Division 1 North of the Southern League, winning that at the first attempt to earn promotion to its Premier Division. However, relegation followed in 1978 when the club finished bottom, but they immediately bounced back by winning Division 1 North the following season. 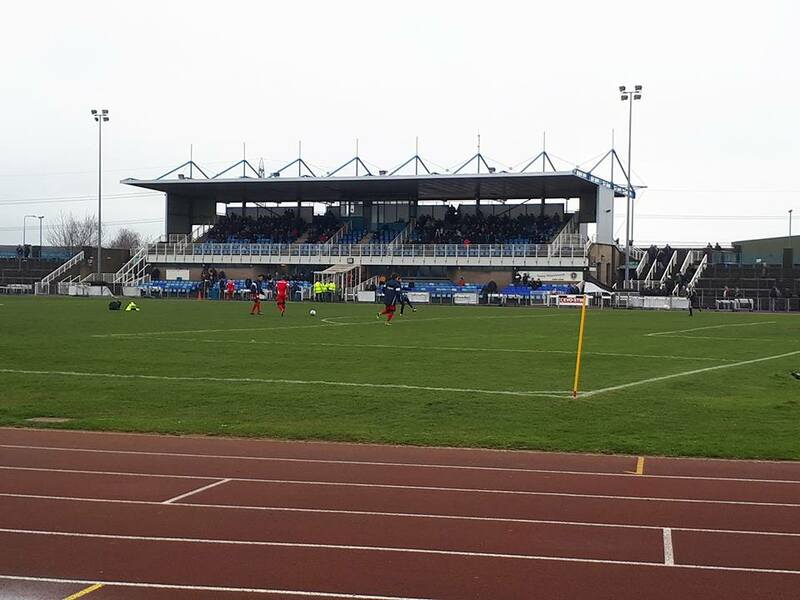 However, rather than returning to the Premier Division of the Southern League, the club were instead transferred to the Northern Premier League. The club didn't last long at this level though, suffering relegation in 1985 and being transferred to the Midland Division of the Southern League. The club changed to its current name in 1987, but did not experience much on-field success until the 1997/98 season, when the club won the Midland Division to return to the Southern League Premier Division. However, they were relegated again at the end of the 1999/2000 season, this time being placed in the Eastern Division of the Southern League. The club once again returned to the Premier Division in 2002 with a runners-up finish, before transferring to the Northern Premier League Premier Division at the end of the 2005/06 season. The club were then relegated to Division 1 South of the Northern Premier League in 2007, where they remained until winning the title in the 2011/12 season to return to the Premier Division, where they have remained ever since, recording a best finish of 8th last season and currently looking on course to better that and finish in the play-offs. 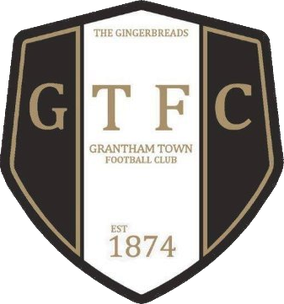 Grantham Town have an illustrious record in FA competitions compared to many non-league clubs, progressing as far as the 3rd Round of the FA Cup on three occasions (1883/84, 1886/87 and 1973/74), but also making it to the 2nd Round on six occasions (most recently in the 1970/71 season) and reaching the 1st Round on eleven occasions (most recently in the 2003/04 season, when they beat Stafford Rangers, Ashington and Ashton United before losing 2-1 at home to Leyton Orient). As for the FA Trophy, the club progressed as far as the Quarter Finals twice, first in the 1971/72 season (beating Bangor City, Connah's Quay Nomads and Chorley before losing to Yeovil Town) and most recently in the 1997/98 season (beating Marine, Leigh RMI, Bath City and Hednesford Town before losing to Southport). Originally, I had entirely different plans over the Easter Weekend, aiming to watch Yaxley play at Kirby Muxloe on Easter Saturday for my 43rd groundhop, and then aiming to watch Yaxley play at Eynesbury Rovers yesterday for my 44th. However, as is starting to become a frustrating tend, the intervention of weather put paid to both of those games early on, and as such my 43rd groundhop was delayed until yesterday. However, it wasn't easy finding a game yesterday at all, as while I started the morning with 10 back-ups, almost all of these were gone at 10am, and of those remaining (Corby Town, AFC Rushden & Diamonds, Histon and Grantham Town) all but this one soon fell by the wayside after pitch inspections had the inevitable outcomes. 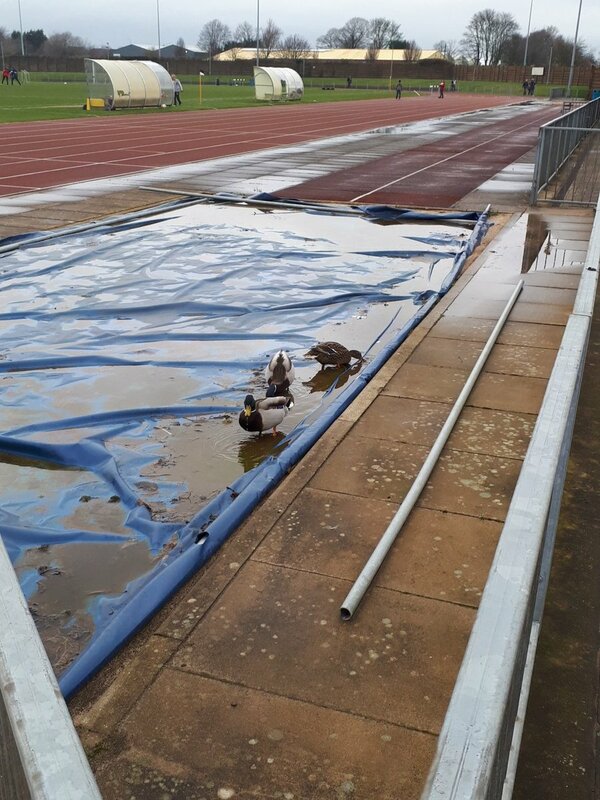 As such, it was a matter of waiting for definitive confirmation that the Grantham game was going ahead (they had sounded very confident about it on Twitter all morning, but as I've learnt, that doesn't always mean anything), and this news came at around 10:40am. As such, I explained the situation to my mum and stepfather (who would be driving me to wherever I ended up yesterday) and plans were quickly made. We set off at around 1:45pm and, after getting stuck in a little bit of traffic here and there, I arrived at the ground at around 2:35pm, grabbing the last programme for £2 before paying my £10 admission to enter the ground. I then did my usual circuit of photos before heading to the food hut just before kick-off, eventually getting my so-called Gingerbread Burger just after kick-off (it was a delicious double-bacon cheeseburger, and at £3.50 was very good value for money) before going to stand in the nearest uncovered terrace. 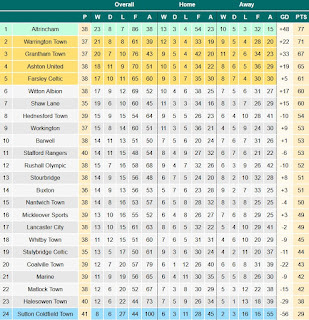 While I got the league table ready for my blog as usual, I didn't actually look at it in detail before the match, so I didn't know either side's exact position in the table. However, I did know that both were competing in and around the play-offs and that both were firmly in the promotion race. As such, I expected this to be a close and feisty contest, but I wasn't really sure which way the game would swing. 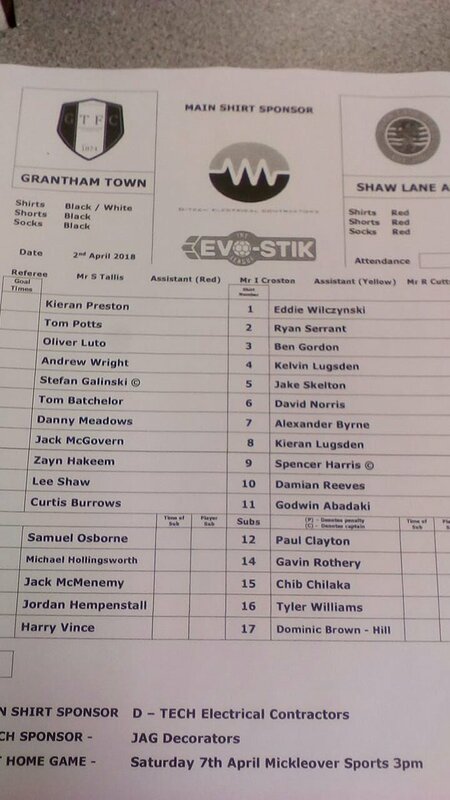 Grantham started the game slightly on the front foot, creating a decent chance on 6 minutes that caused some trouble for Shaw Lane's goalkeeper Eddie Wilczynski. However, it was the away side who opened the scoring against the run of play on 11 minutes, some lax defending allowing a cross into the box that Kieran Lugsden tapped in at the far post. While this was against the run of play at the time, it gave Shaw Lane a significant boost in confidence that saw them start to exert some degree of control over the game, although Grantham did create a great chance on 18 minutes, one that many people in the ground (myself included) initially thought had gone in: Curtis Burrows received the ball near the box and got a shot away, but it was deflected just wide and into the side netting for a corner. The half continued with each side creating chances here and there, but a couple of patterns in the play quickly became apparent: namely, the aforementioned wind - which I didn't notice standing on the terrace, but was causing many goal kicks, crosses and through balls to go massively wayward - and the subtle time-wasting efforts of Shaw Lane, particularly from Wilczynski (starting from about 15 minutes onwards, he was taking as long as possible to get up after saves and to take goal kicks, and a similar approach was taken in relation to throw-ins, albeit with much more subtlety). Both of these factors hindered the quality of proceedings, but Grantham steadily started to grow into the game as the half continued, while Shaw Lane seemed satisfied with their one-goal lead, with not much ambition to increase it. In any event, half-time arrived without many incidents of note, with the away side maintaining their tenuous yet seemingly comfortable lead (though it was only a one goal lead, Grantham didn't really look like scoring in the first half, and it was entirely reasonable to assume that this could continue after the break. The second half was initially very stop-start, with niggly fouls and injuries halting proceedings and consistently disrupting the flow of the game. It didn't take long for things to calm down, though, and the game was able to flow again, something which seemed to benefit Grantham much more than Shaw Lane. While there had been small hints of it in the first half, the creativity of the Grantham attacking line-up starting to become apparent, with Tom Batchelor going close twice, first being unable to make contact with a corner in the 63rd minute and then having a header well-saved by Wilczynski in the 66th. The game then well and truly came to life in the 68th minute when Grantham finally equalised, Tom Batchelor slinging a ball forward to Danny Meadows, who played the ball into the centre of the box for star striker Lee Shaw to collect the ball and dribble past some defenders and then Wilczynski to score. The goal had certainly been coming, and it wasn't at all surprising when another came just five minutes later, Jordan Hempenstall playing a ball into the box where, after a defensive scramble, Lee Shaw got a shot away to score his second of the game, and his 32nd of the season. At this point, the momentum had fully swung Grantham's way and, despite some efforts by Shaw Lane to create some chances and get back into the game (in particular, Godwin Abadaki always looked threatening for the away side, and it was to the Grantham defence's credit that he didn't have much of an influence on proceedings), they were now in complete control, creating chance after chance. However, they did very nearly give away a goal after Lee Shaw's second, Kieran Preston almost playing himself into trouble in the Grantham goal and almost giving Abadaki an open goal to score in. Fortunately for Preston, Batchelor was on hand to deal with it, preserve Grantham's lead and spare his goalkeeper's blushes. Samuel Osborne almost scored a third for Grantham not long after this, Lee Shaw's ball setting him free in acres of space to shoot, only for his shot to hit the post and head back out into play. The third goal eventually came on the 83rd minute, Oliver Luto's free kick from 25 yards out being cleared out of the box to Jordan Hempenstall, who was able to move into the box and get a powerful shot away to score. 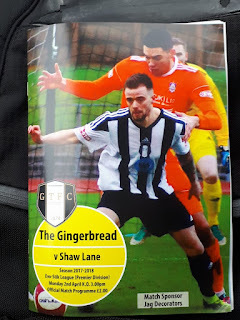 After this, with Grantham satisfied with their lead and Shaw Lane having nothing to offer in response, the game largely petered out, with the only notable incidents being a couple of rough tackles from the Shaw Lane players, undoubtedly coming out of sheer frustration. One of these incidents almost threatened to boil over, but the referee (who had been done a reasonable job, making a few questionable decisions but mostly seeming consistent) dealt with the situation quickly to avoid that, although many were dissatisfied with the yellow card given to the offending Shaw Lane player as they (correctly, in my opinion at least) thought that the tackle was dangerous enough to justify a red card. In any case, the game finished without further goals, and Grantham finished as deserved victors. Overall, it wasn't very easy to write a match report for this game, partially because a reporter for the local newspaper had already published his report online but mainly because, while there were several notable incidents throughout the game, there were large stretches where virtually nothing happened, especially in the first half: the ball spent a lot of time in the air - not helped by the wind, in fairness - and, as such, there wasn't much to really take in from a tactical or entertainment perspective. 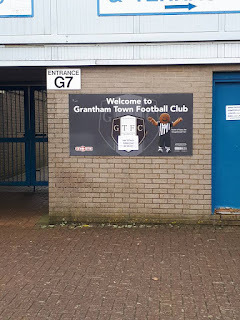 However, despite that, I still feel that this was mostly a good game, with Grantham steadily growing into the game and eventually producing a dominant performance against a disappointing Shaw Lane, who looked very poor for a side chasing promotion. 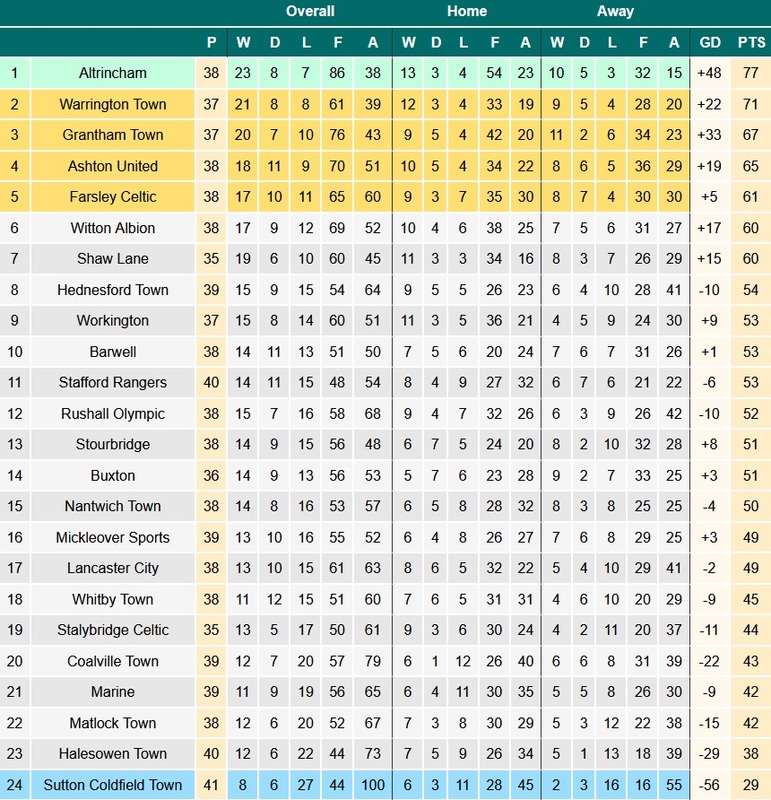 However, Shaw Lane are in that promotion race for a reason, so it will be interesting to see if they can bounce back and finish in the play-offs, and to see if Grantham can maintain their current form to do the same, or maybe even go one bettter (although Altrincham's seven-point gap makes this unlikely, but not impossible). On the whole, though this was once again not the intended destination (I seriously hope that's the last time I have to type that this season), this was another enjoyable groundhop, with a good game, excellent food and a great atmosphere throughout, and the weather ended up being fairly reasonable throughout as well (not much rain during the game, just lots of the wind, and the sun did come out every now and then). As for future plans, my next groundhop is likely to not be until Saturday the 14th, when I hope to visit Chatteris Town, but I am going to try to convince my dad to take me to Norwich CBS on Saturday after the early kick-off at Carrow Road, which will likely be yet another miserable result in a poor season. However, I don't expect that to happen, so the 14th is most likely for my next groundhop. Other than that, Yaxley's game at Eynesbury has been rearranged for Thursday the 19th, so I'll try and go to that if I can. South Kesteven Sports Stadium is a much-maligned ground, but one that I personally feel is under-appreciated by many people. Really, the only issue is the athletics track around the pitch, which does mean that you are quite far away from the pitch wherever you stand or sit. However, the ground is largely built in such a way as to do a good job of offsetting this, with decent elevation provided by the main stand, the two uncovered terraces and the covered terrace. The main stand is on the near side of the ground and provides seating for 650 people, which is split across two tiers (most of the seating is in the upper tier, though). On either side of the main stand is an uncovered terrace, each of which provides standing space for around 450 people. Across from the main stand, on the dugout side of the ground, is a large covered terrace, which provides standing space for around 1,000 people and was today used by some of the most vocal Grantham fans. Other than this, the rest of the ground is open hard standing, but there are five steps of terracing behind each goal that curve around the perimeter, with large grass banks behind each of these. Official, the ground's current capacity is 3,960, but the club believe this could be increased to 5,000 with the addition of more turnstiles. As it is, though, the ground is more than good enough for Step 3 and would likely be sufficient for Step 2, should the club be promoted to that level this season or in the future. As a Grantham Town FC fan I thought the report was a very accurate portrayal of the match.